A performance of This Accursed Thing at Manchester Museum. The piece dramatised Manchester’s role in the Transatlantic Slave Trade. Taken in 2007. As a curator I could easily be accused of nit-picking but working with performers and writers provides an invaluable opportunity to introduce both emotion and experience. Tonight’s performers conducted extensive research and became thoroughly enthralled by Native North American history and culture. Combining this with their own experiences of change and continuity has produced truly captivating and sensitive pieces. 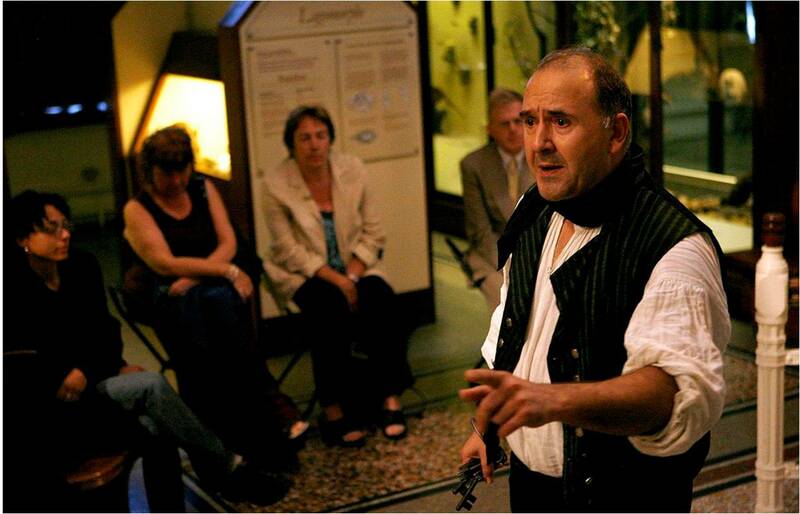 At Manchester Museum we’re always looking for innovative ways to further understanding between cultures. Drama, poetry and performance are invaluable tools in this endeavour. The Dalai Lama finally touched down at Manchester Airport yesterday. Over the next several days he will address a congregation of literally thousands at the MEN Arena. Upon his arrival at the Lowry Hotel he greeted Salford mayor Ian Stewart with a customary Tibetan scarf ceremony. 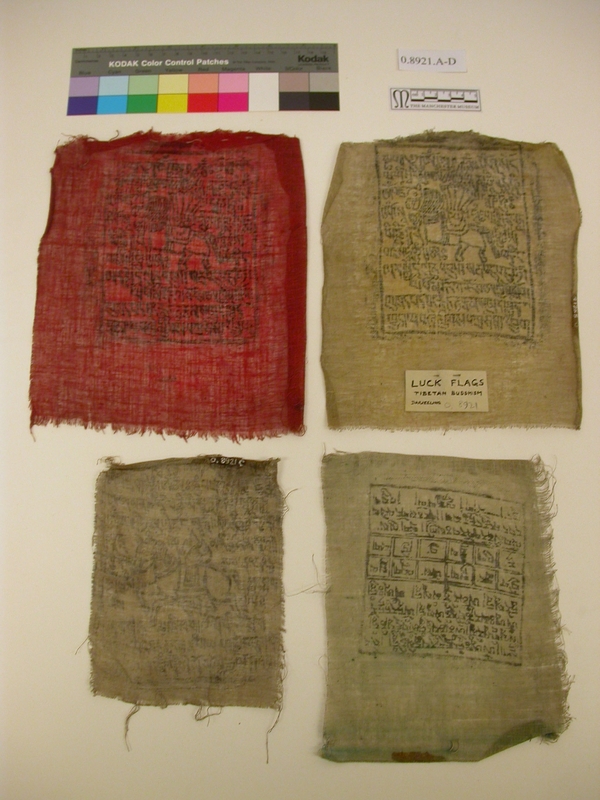 We have several textiles from Tibet in the Living Cultures collection, including a shawl and prayer flags. The shawl was donated by Ms L Start and is expertly woven with geometric and animal designs. It is likely to date around the early 19th century. Shawl. Tibet, Asia. Early 19th century. The Manchester Museum Living Cultures Collection. The prayer flags were donated in 1955 by Prof. Rev Lawrence E Browne and depcit the wind horse, or lungta. In Tibetan Buddhist belief the wind horse represents good fortune. Prayer flags. Tibet, Asia. 1955. The Manchester Museum Living Cultures Collection. Here’s hoping the Dalai Lama’s visit is a successful one. Buffalo Bill’s Wild West company spent several weeks in Salford in 1887 and the Manchester Museum has some very special, and unique, material relating to this occurance. In pervious blog posts I’ve detailed this material (https://mancultural.wordpress.com/2011/01/19/the-return-of-red-shirt/) but if you’d like to find out more I’ll be giving a talk this Friday at 1pm in the Museum as part of the Manchester Histories Festival. Please do feel free to drop in but do be aware that space is limited so be punctual! Several months ago now I had the good fortune to meet playwright Anjum Malik. 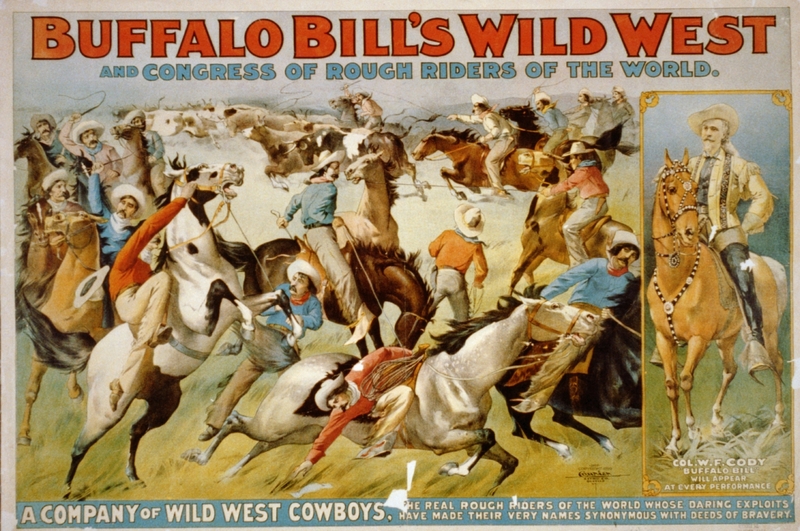 Anjum was conducting research into the Native American performers who accompanied Buffalo Bill during their stay in Salford in the later 19th century. This research formed the basis of her play which was commissioned by BBC Radio 3 to celebrate the opening of the BBC North’s new premises at Salford Quays in 2011. 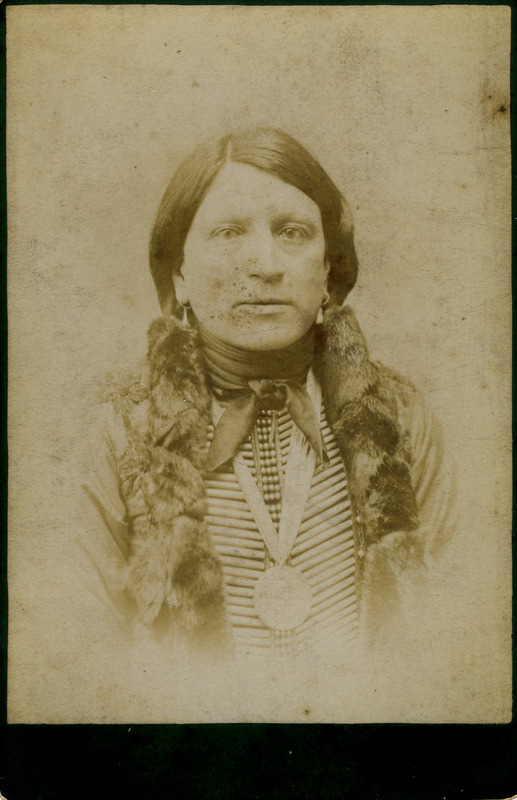 I was able to share with Anjum some of the wonderful archival material in the Living Cultures collection related to this historical event, specifically the portrait of Oglala Lakota Chief Red Shirt as taken by Salfordian photographer C.R. Brandis. Red Shirt, Oglala Lokota Chief, Late 19th Century, Salford, UK. The Manchester Museum Living Cultures collection, 2012. 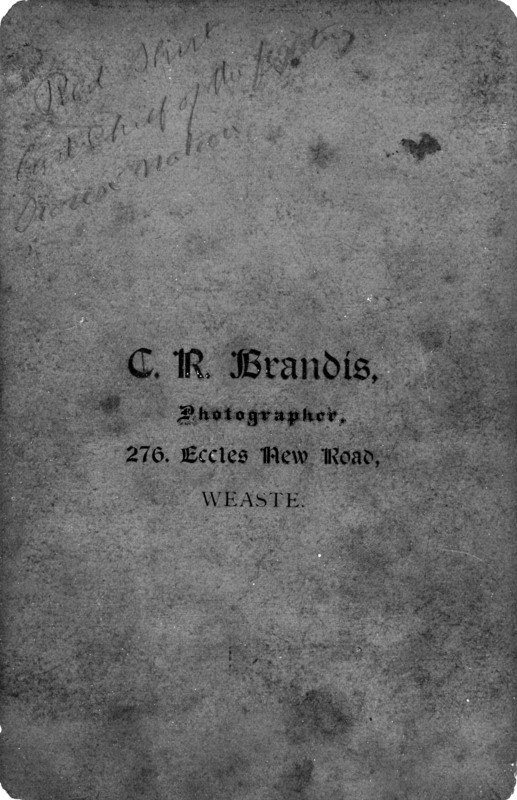 Reverse of Red Shirt portrait showing Brandis stamp, Late 19th Century, Salford, UK. The Manchester Museum Living Cultures collection, 2012. The discovery of some archival material has caused somewhat of a stir amongst local journalists recently (http://www.salfordonline.com/salfordvideos_page/25466-video:_salford_big_chief_found_in_manchester_museum.html). 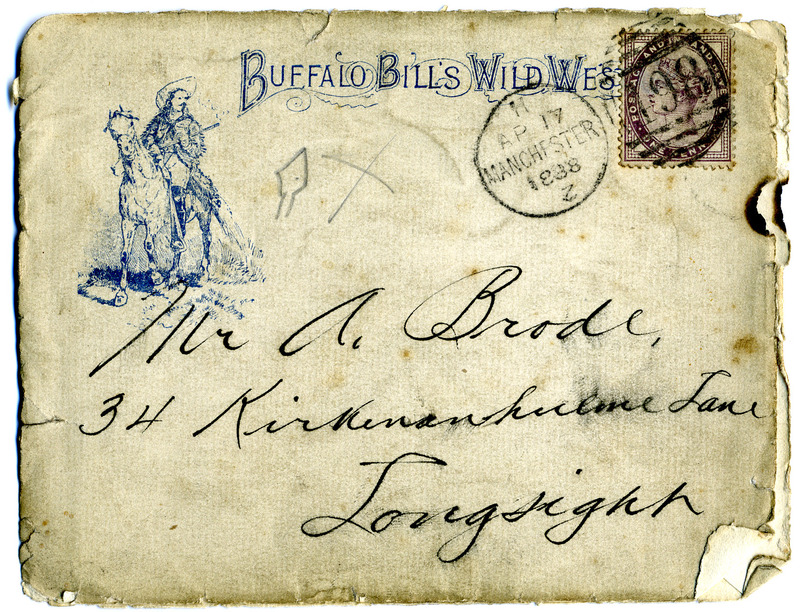 The material consists of a letter addressed to a Mr. Brode written on Buffalo Bill official stationery and a photograph of an American Indian called Red Shirt. The letter is dated 1888 and was written by Buffalo Bill’s secretary S. Hanfield. From November 1887 Buffalo Bill’s Wild West company was encamped on the banks of the River Irwell, Salford, Greater Manchester, and would remain there performing to crowds of local people for several months. Red Shirt, Oglala Lokota Chief, Late 19th Century, Salford, UK. The Manchester Museum Living Cultures collection, 2011. 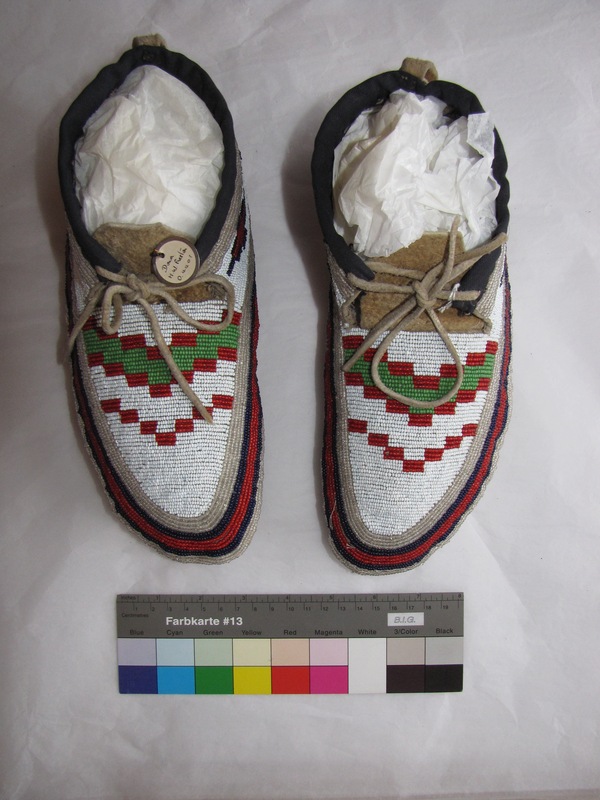 Hanfield states in the letter that he also sent Brode a pair of moccasins which were made at ‘Pine Ridge Indian Agency, Dakota, U.S.A.‘ and worn by Red Shirt during performances. Red Shirt was a Oglala Lakota American Indian and to this day his people live at the Pine Ridge Indian Reservation, South Dakota. The photograph, taken by Salford photographer C.R. Brandis, is the only known image of Red Shirt taken during his time in Salford. Moccasins, Late 19th Century, USA. The Manchester Museum Living Cultures collection, 2011. In 1928 Mr. Freston, chair of The Manchester Museum Committee at the time, donated a pair of moccasins which he claimed belonged to an ‘Indian Chief’. It is possible that these moccasins are the ones mentioned in the letter.